There have been several hardware and feature leaks surrounding two of the most anticipated and powerful handsets to be released in the smartphone market; Samsung’s Galaxy Note 5 and Apple’s iPhone 6s. Before these two smartphones are officially launched, let us bring you guys closer to what these mobile computing powerhouses are going to be capable of once they set foot in the ever-proliferating market. Let us begin. Thanks to Samsung’s 14 nm FinFET, Exynos 7420 present in the Galaxy S6 duo has displayed remarkable performance, even in leaked benchmarking tests against Qualcomm’s Snapdragon 820. The performance showcased thanks to Samsung’s superior architecture is probably the reason why Apple tapped the South Korean giant to mass produce the company’s A9 SoC. Earlier, there was a rumor suggesting that Galaxy Note 5 was going to feature the Exynos 7422. Since Samsung has to raise the performance bar and find a way to beat Apple A9, we expect Exynos 7422 should deliver far better performance compared to Exynos 7420. 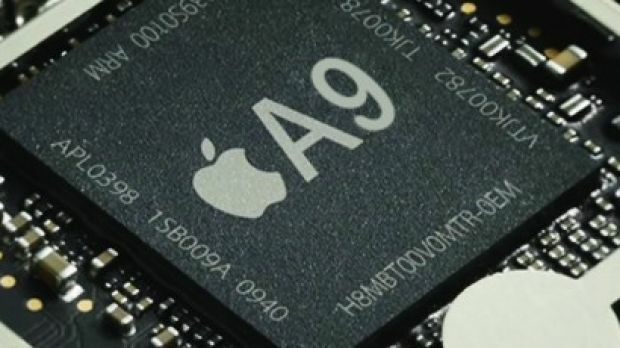 Just like its predecessors, Apple will most likely incorporate a dual-core processor in the A9 and just like we have seen in the past, software optimizations and tweaks are also responsible for performance enhancements, as Apple likes to keep on reminding us, it is not just a matter of processor cores that make or break performance (Apple iPhone 6 Vs Samsung’s Galaxy Note 4). We are confident that Apple A9 will be far more capable than Apple A8X (which as able to thwart NVIDIA Tegra K1) and Samsung will try to do everything in its power to make sure that Galaxy Note 5 takes the crown in the performance category. In a previous leak, it was stated that Galaxy Note 5 will exude a 4K resolution. In an effort to raise the bar in other features besides its chipsets, Samsung is expected to increase the total pixel count in its upcoming flagship phablet, since its Galaxy S6 duo already renders the 1440p resolution. As for iPhone 6s, Apple too is expected to increase the pixel count, but its plans do not appear to be as ambitious as Samsung’s. According to some sketchy rumors that go against Apple’s closely held tradition, the company is to incorporate a 1080p display on iPhone 6s and a 1440p one on its iPhone 6s Plus. While both handsets are expected to feature impressive processors, we cannot help but wonder that Galaxy Note 5 twill be left behind in the benchmarking results thanks to its UHD resolution. Not only will 4K have an adverse effect of battery life, but it will also require additional firepower when benchmarking tests are being conducted. 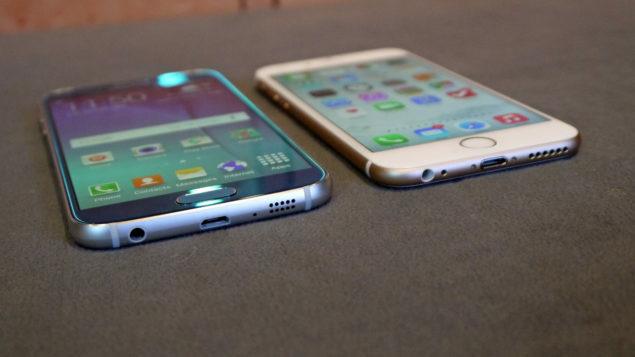 This is where iPhone 6s will be able to gain the upper hand. Since 1080p is a mainstream resolution that even mid-ranged smartphones possess, you can expect this iPhone to strike hard and obtain impressive results. Let us hope Samsung knows what it’s doing by cramming a large number of pixels in a small screen. Just like its iPhone 6 duo, Apple plans on maintaining the same screen sizes for its upcoming handset duo (iPhone 6s to feature a 4.7 inch screen size while iPhone 6s Plus will feature a 5.5 inch one), which should be expected, given Cupertino’s propensity to combat change. Samsung, on the other hand, believes in the popular adage ‘Bigger is Better’, and abides by it religiously. That being said, we can expect a 5.9 inch screen present on the Galaxy Note 5, which is going to be about 0.2 inches larger compared to Galaxy Note 3 and Galaxy Note 4. Seeing as how Galaxy S6 is armed with 3 GB of RAM, we should expect no less than 4 GB of LPDDR4 RAM present in Galaxy Note 5. As for the upcoming iPhone 6s, the latest rumor suggested that 2 GB of LPDDR4 RAM will be present underneath the hood of the device, which should provide sufficient performance as far as multitasking and gaming is concerned. Those that consider 2 GB of RAM far too low for a high-end device like iPhone 6s should take a stroll down memory lane and see how a dual-core processor present in Apple’s mobile gadgets are able to make short work of those that feature twice the amount of RAM and processor cores. Like always, half the magic comes from an optimized mobile platform. While there is no information on the rear and front camera resolutions that Galaxy Note 5 will be sporting, we do know that Apple is going to be implementing a very significant upgrade as far as the rear camera sensor on iPhone 6s is taken in to account. 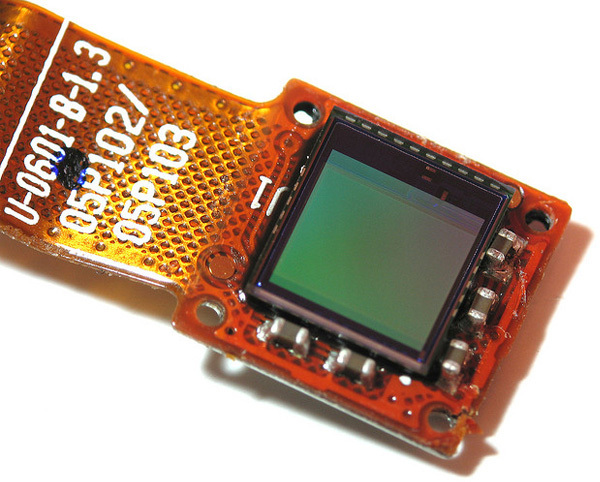 According to the latest report, iPhone 6s is expected to sport a 12 MP Sony RGBW Sensor. The sensor will help the device capture better images in low light scenarios as it ends up reducing overall image noise, allowing for better quality images. What’s more is that if we consider it in light of earlier news that the iPhone 6s will be employing smaller pixels, then it could end up compensating for loss of quality in low light scenarios, which is a result of pixel size decrease. 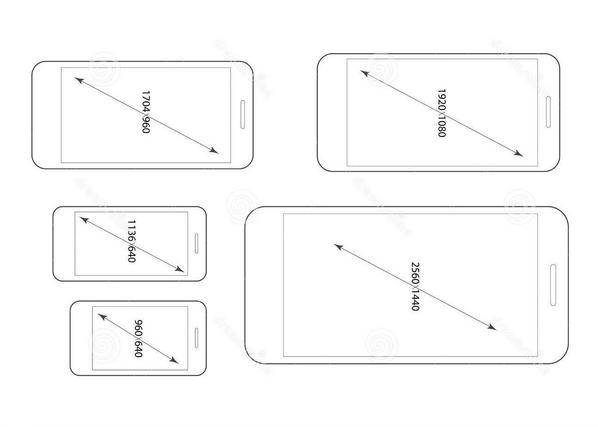 Coming to Galaxy Note 5, we expect the upcoming phablet to be armed with a rear sensor that has an image capturing resolution exceeding 16 MP (present on Galaxy S6). Unfortunately, there is no other information regarding this front, so unless more leaks become available, we cannot comment on this particular specification. Not only are the Galaxy Note 5 and iPhone 6s going to feature the best of what mobile computing components have to offer, but both devices could also be running the latest mobile operating systems when they officially make their way to retailers and market shelves. 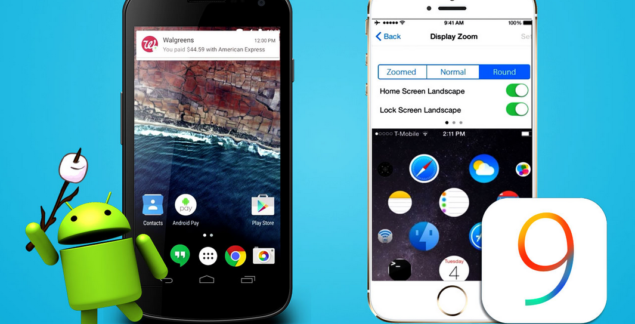 As you all know, Galaxy Note 5 is going to be running Android M, while iOS 9 will be running on iPhone 6s. In order to make update downloading processes simpler, iPhone 6s will no longer be shipping out in 16 GB as the base capacity models. Instead, the base storage has been upgraded to 32 GB. Samsung Galaxy Note 5 will most likely feature a MicroSD card slot, where users will be able to upgrade their existing storage up to 256 GB. Let us hope that the company does not use the same approach as it did with its Galaxy S6 duo, which are currently void of an expandable storage. 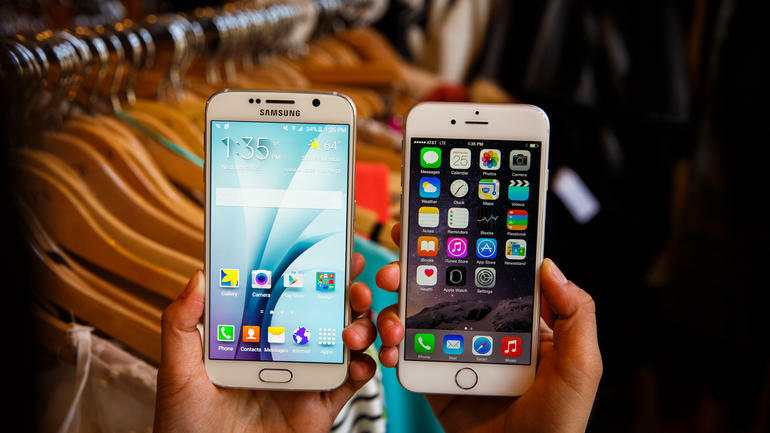 It is expected that Galaxy Note 5 and iPhone 6s are both going to be showcased during the month of September. There was an earlier rumor which stated that iPhone 6s is slated for a September 8 release, but looks like we can only confirm this when the aforementioned date approaches. For now, we will just stick to the month of September. Furthermore, both devices being released during the month of September will also allow critics to setup a proper comparison chart between both smartphones instead of having to wait a millennia to compare Galaxy Note 5 and iPhone 6s. Well there you have it folks; all the necessary information that you needed to know before the imminent release of the Galaxy Note 5 and iPhone 6s. The two biggest smartphone giants in the industry will be battling it out with their flagship offerings to see which one will be crowned the 2015’s top smartphone. Are you guys excited for the release? Do you feel that we missed out any detail? Do let us know your thoughts in the comments section below.